My Tipsters is a social betting network for those who enjoy betting on sports. 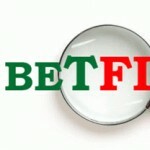 Share and get free betting tips from professional tipsters. Our mission is to educate punters and help you win more money from the bookmakers. Any posted tips do not guarantee success and are a challenge only.